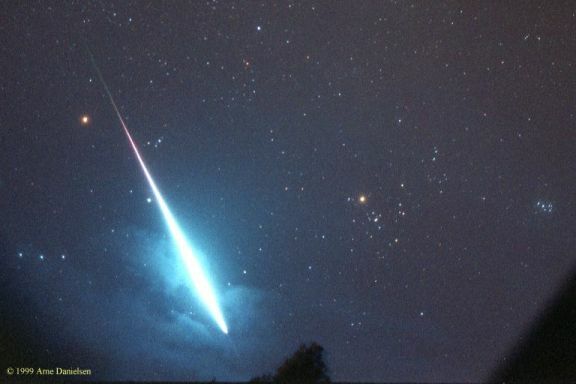 Explanation: Most Leonid meteoroids, the bits of comet debris which produce the annual Leonid meteor shower, range from a mere millimeter to a centimeter in diameter. Yet these cosmic grains of sand and gravel can put on quite a spectacular show. How can something so small generate so much light? The answer is their astronomical speed, as these particles enter Earth's atmosphere at around 71 kilometers per second. In the high-speed collisions with air molecules, electrons are stripped from atoms as meteroid material is blasted away. When the electrons recombine with the atoms, light is emitted. This dramatic example of a brilliant 1999 Leonid meteor was photographed while tracking the stars in partly foggy skies on November 18, from a location near Dagali, Norway. The two bright reddish-orange stars visible are the familiar giant stars Betelgeuse (left) and Aldebaran.